During the first two weeks of July, I faciliate together with Laura Malinverni a summer camp for 20 girls from Barcelona in which they learned about the basics of 3D printing, robotics and coding. This hands-on workshop introduced them to the world of Digital Fabrication. 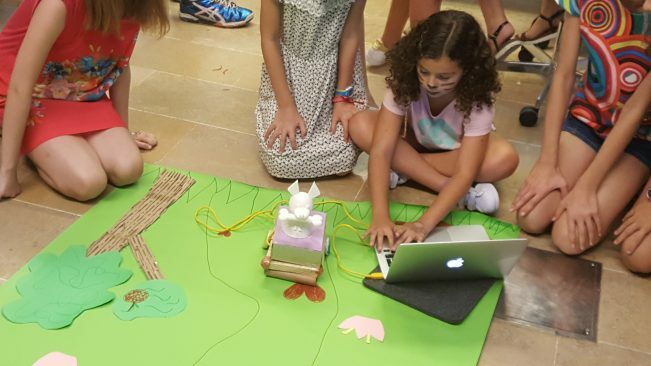 The #Girlstech Summer Camp was co-organized by the American Space Barcelona and the Department of Information and Communication Technologies Engineering (ETIC) of Universitat Pompeu Fabra. I regularly participate in the organization of workshops to inspire teenagers in digital fabrication. Another workshop was held in April 2017 at the American Space Barcelona and focused particularly on a critical reflection upon how technology influenced our personal lives. In June 2017, Maria Santos and I also participated in the Oracle4Girls which aimed to attrack and retain girls in STEM and we conducted a second workshop in this line.